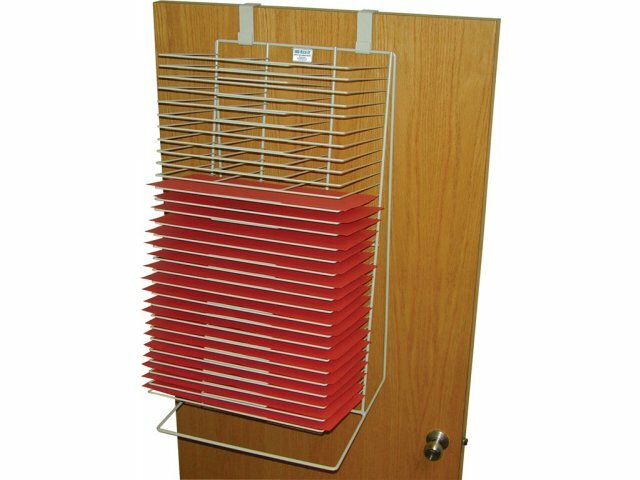 Wall/Door Drying Rack - 30 Shelves 12"x18"
If you are really short on space in your art-room, these door- or wall-mounted drying racks work wonders. 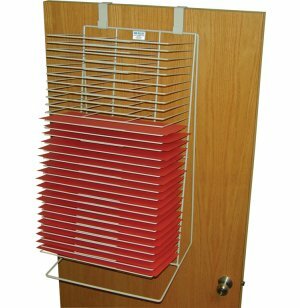 Whether you are storing artwork in your classroom or drying prints at your studio, a wall/door rack give you a space saving, air-drying option. This 30-shelf unit helps you get the most out of your working environment. Like the bigger freestanding drying racks, these wall- and door-mounted racks are made from all-steel construction. They are powder coated for extra long life. Each shelf is 12 by 18 inches and has six ten-inch mesh openings for air circulation. Shelves are designed to be rust-proof and non-warping even with heavy daily use. Convenient Use: Rack mounts either to doors or walls, allowing you to take advantage of every nook and cranny, and dry projects without crowding them. Speedy Drying: Shelves with mesh openings are spaced 1" apart to promote efficient and quick evaporation drying of art projects.